Twenty-six campsites with electricity and water and 50 campsites without electricity are available on a first come, first serve basis. Speed limit 15 MPH around the lake. No three (3) or four (4) wheeled recreational vehicles allowed on lake property. No fireworks or firearms on lake property. No glass containers on lake property. No alcoholic beverages in beach area or in boats. Allowed only in your own campsite. No one allowed in lake area between 10:00 P.M. and 6:00 A.M. except campers. No swimming within 150 ft. of boat docks or boat ramps. All pets must be on a leash and can't be in swimming area. Horse riding resticted to riding trails only. Horse loading and unloading permitted ONLY on east side at Boy Scout Camp Grounds. Trail Riders must present a Coggin's Test Certificate before they will be allowed to use the trails. Remember!!! There is Zero Tolerance on rule violations. Must be 18 years old to camp by yourself. All camping is on a first come only basis. A 14 day stay limit on All camping will be enforced. Only 2 tents or 1 camper and 1 tent are allowed per camp site. Quite time is from 10:00 P.M. until 6:00 A.M. 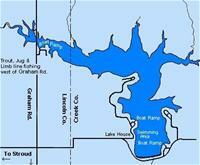 Check out time is 3:00 P.M.
YOU are responsible to know all State & Municipal Laws Before entering lake. Ignorance is no excuse to break the law. ALL water vessels must go COUNTER CLOCK WISE on the lake. Jet Boats must have baffles in mufflers. You must stay 150 ft. from any vessels and swimming area. Stroud Lake is located 3 miles north and 3 miles east of Stroud. See Google Map for directions. Click image for a larger map.